Hello explorers! Hoping you enjoy the results of a two week journey in, out, and around astonishingly lush jungles and smile-inducingly friendly small towns of Costa Rica with Wild Planet Adventures. After landing from a red-eye out of LAX our journey immediately began by picking up companion travelers and making way to our accommodations. Inching closer and closer to the coast along the way our van stalled while navigating a highly flooded coastal road! We were stuck in hot and sticky air, bugs and birds abound....but isn't that exactly what makes it an adventure?! Speedbump out of the way, the trip could now truly begin. Traveling to new locations for fresh activities almost daily we visited places like Cahuita, on the Caribbean side of the country, to experience a beachside hike through Cahuita National Park where we saw howler monkeys, dozens of birds, whiptail lizards, and hundreds of insects. Wet, thunderous nights awaited us in Sarapiquí, although it brought out at least ten marvelously different species of frogs for our exciting night hikes, along with ramping up the rapids for white water rafting the Sarapiquí River the following day - a supreme rush that will fill you with life! Later we visited Arenal where we had a mostly cloudy view of the volcano, but it was all still quite formidable - we did get to enjoy hot springs too - as well as interact with wildlife at a great operation called Proyecto Asis. In La Fortuna, Proyecto Asis takes in injured wildlife found throughout the country and those confiscated by police from households having been owned illegally, here we learned about animals ranging from spider and white faced capuchin monkeys to scarlet macaws and peccaries. Eventually our travels took us up ravenously rugged roads to chilly cloud forest heights of Monteverde. Here we visited hummingbird and butterfly gardens, explored Selvatura Park via traversing misty canopy bridges and zip lining over trees and through clouds! We spent our final nights in hydroelectric & solar powered jungle lodge on the Osa Peninsula, along the southernmost tip of Costa Rica, bordering virgin rainforest of Corcovado National Park where we tackled a testy hike along the coast with potential views for jaguars, puma, monkey, endless scarlet macaws, and more! Our journey was absolutely amazing. There were great challenges and greater rewards that I will cherish for the rest of my life! Endless thanks to our incredible guide Mario, fantastic driver Pablo, and travel companions Sally & Merrill. 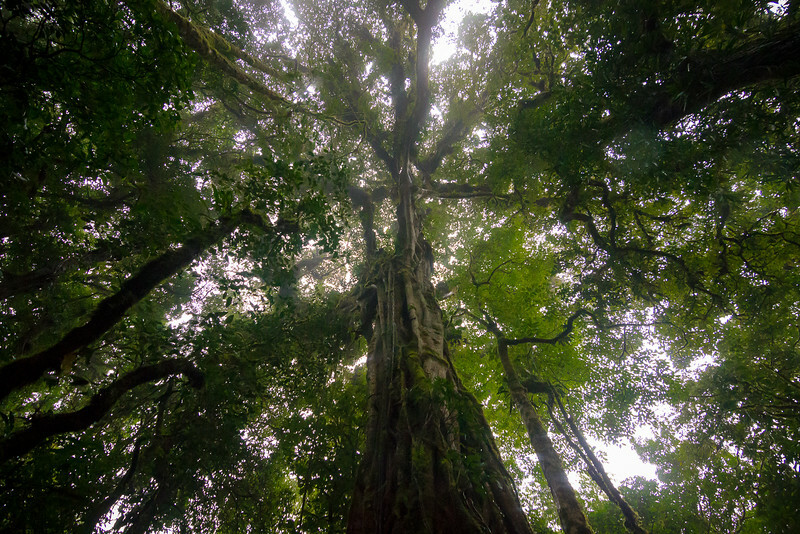 One can only feel humbled when sizing up an impressive hundreds-year-old strangler fig (Ficus aurea) tree in the secluded Monteverde Cloud Forest Biological Preserve in Costa Rica. At Around 5000' above sea level, the preserve is a stunning non-profit organization gathering critical information about the environment. Here, biodiversity reigns supreme, with thousands of different types of plants and insects, and hundreds of birds and smaller critters.